We’re starting to see data trickle in following Apple’s launch last weekend of its new budget-priced and budget-sized device, the iPhone SE. While we didn’t expect tents and lineups for this latest iOS device, new data suggests far fewer iPhone SE sales compared to other recent iOS device launch events in recent years. According to data from the analytics firm Localytics, the iPhone SE has seen the weakest weekend launch in three years, seeing fewer sales in the first weekend than any other device, including phablets like the iPhone 6 Plus and 6S Plus. There wasn’t much fuss this weekend at stores offering the new iPhone, especially when compared to the flagship iPhone launch each fall. No one was waiting out in the rain (or snow, for some East Coasters) which is what Localytics’ data ultimately confirms. The analytics firm appears to pull its information based on how many devices are live that identify themselves as the iPhone SE when browsing the Web or running apps. The Localytics data suggests there were only 11 percent as many first-weekend sales compared to previous iOS devices launches. Apple of course hasn’t yet released any sales data itself, so this is about the best we can use to interpret ongoing sales. This could be in part due to the lack of promotions, as far fewer retailers and carriers hyped up the iPhone SE’s launch compared to a flagship iOS device’s launch. Plus the spring launch is out of sync for many iOS device owners, who typically upgrade around the same time each year when the latest iPhone is launched. Things fared much better for the iPad Pro, however. 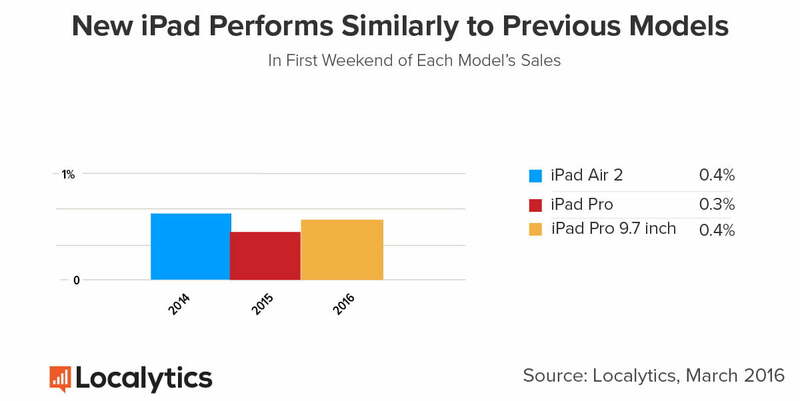 According to Localytics, the new iPad Pro 9.7-inch saw even better first-weekend performance compared to its sister device, the iPad Pro, and its launch last fall. The iPad Pro doesn’t follow an upgrade cycle like the iPhone and offers a flagship experience as opposed to a smaller, budget-oriented experience like with the iPhone SE. Of course, this data is only based on three days of sales, and the hype around the iPhone SE is hardly what we’ve seen for other flagship iOS devices. Localytics’ data also doesn’t share any insights about sales performance for Apple’s last low-end device, the iPhone 5C. We’ll have to see how the iPhone SE and iPad Pro 9.7 fare in the coming weeks to truly know how successful they are in giving Apple some out-of-season love.